It’s been a fairly long time coming, but Mr. Driller has finally arrived at the next generation, burrowing his way through your Ethernet cable and finally landing on your Xbox 360 hard drive. Mr. Driller is one of the most popular puzzle games you’ve probably never played. And while it looks rather complicated at first, its complexity really resides just a bit above something like Tetris. All you really need are quick reflexes and a good understanding of how different geometrical shapes will interact with each other when one of them is removed. Yeah, most people start off Mr. Driller by simply drilling straight down a vertical shaft on each level, but that won’t get you very far. The idea here is to make it to the bottom of each “well” while racking up points by matching blocks of the same colors. Of course, while you’re doing it you have to decide whether to go after bonuses and the all-important air canisters (read: extra time on the clock) without getting squished by all those falling blocks. 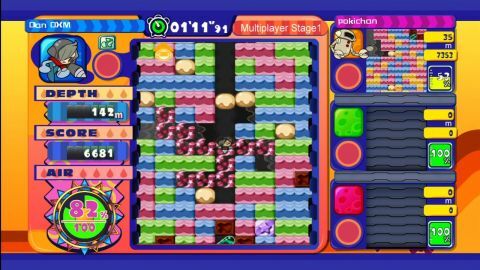 Mr. Driller on Live Arcade also marks the first time players can go online and compete or cooperate in a couple of different gaming modes. Unfortunately, as of this writing, the online play is spotty at best, suffering from lag and other issues to the point that it’s unplayable most of the time. It seems Mr. Driller is online in delivery method only right now. The visuals leave a bit to be desired, too. Mr. Driller is obviously repurposed from a previous game, and nothing has been done to the sprites to make them look good on an HD television set. Everything on the actual play screen looks as though it’s had Vaseline smeared all over it. Nonetheless, Mr. Driller is a quality game. Hopefully Namco fixes the online issues with a patch. Description Slightly flawed Mr. Driller - a great puzzle game you probably never played. Get squished online with this classic gameplay.